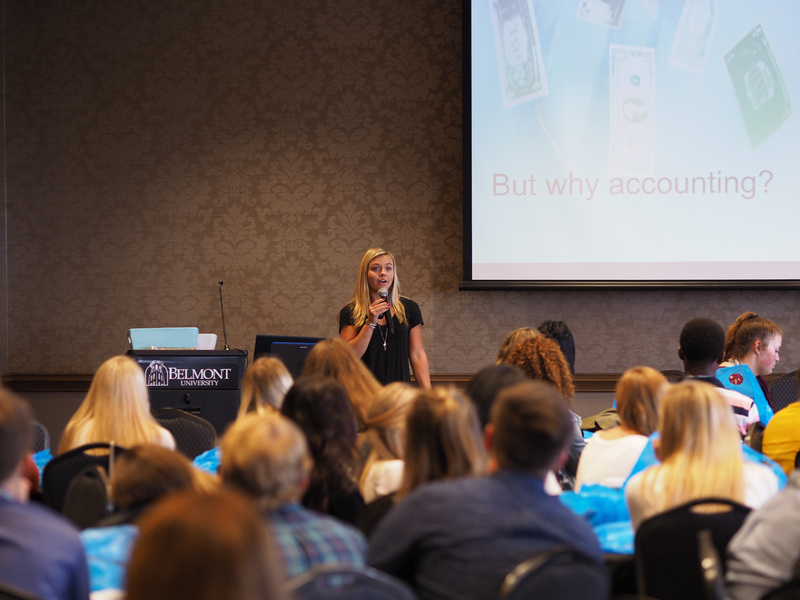 The accounting and management information systems (MIS) programs in the Jack C. Massey College of Business hosted a Discover Accounting Day for 70 Nashville area high school students last month. Associate Professor of Accounting Dr. Beverley Alleyne motivated the students with words of wisdom on how to prepare for college and for the real world of an accounting career. Alexis Wade, senior accounting major, spoke to the students about why accounting is a great major and ideas for funding their college education. Students had the opportunity to learn about careers in accounting, why accounting is considered the language of business and to discover which path of accounting best fits their interests and personality. Students interacted with local Nashville CPAs, including Chief Financial Officer of of the Tennessee Titans Jenneen Kaufman, Belmont Masters of Accounting alumni Allie (Shropshire) Zavattaro (senior accountant at Compass East), Lauren Moses (tax senior at Cherry Bekaert) and Accounting Advisory Board member Kristi Fireline (director at BKD). In addition to the day of accounting information, the high school students “discovered” the Belmont campus with lunch in the Harrington Place Dining Hall. The one-day event was planned and coordinated by Laura Hunt, communications associate for the Tennessee Society of CPAs, and Dr. Del DeVries, associate professor of accounting and information systems. Dr. Pat Raines, dean of the Jack C. Massey College of Business; Kelvin Ault, professor of practice and program director of accounting and MIS; and Taylor Dillon, admissions coordinator, also assisted in welcoming the high school students to campus.